We report 14 years follow up of our first REVAR (Endovascular repair of ruptured aneurysms)performed for a leaking abdominal aortic aneurysm post open repair. An aorta uni-iliac device was used and femoro-femoral bypass graft was carried out. The patient did not have any further intervention. This procedure was performed as a salvage procedure post open repair. This case illustrates the durability of endovascular intervention. He had six CT angiograms during the 14 years follow up. A 69 year old gentleman with a background history of previous coronary artery bypass graft underwent open abdominal aortic aneurysm repair for a 9 cm symptomatic juxta renal aortic aneurysm with a 20 mm dacron graft 14 years ago. He had pneumonia and pseudomembranous colitis post operatively but recovered completely and was discharged home. He returned within 2-3 weekswith abdominal and back pain. MR angiogram showed contained rupture of the double breasted aortic sac post open repair with disruption of the anastomosis mimicking a type Ia and 1b endoleak and haematoma was noted to the superior and inferior part of the graft(Figure1). An aorto-uni-iliac device Talent graft (World Medical, FL,USA) was deployed with a Talent occluder to the left common iliac artery and a right to left femoro-femoral bypass graft was performed with 8 mm dacron graft. Figure 1. MRA 2-3 weeks post open surgical repair demonstrating Type I endoleak. He has been followed up by Duplex Ultrasound scan and CT angiograms (5 CT angiograms post operatively)for 14 years. He did not have any further intervention to the aorto-uni-iliac stent graft. Over the course of 14 years, he developed gout, CRF, chronic venous insuffeciency, varicose veins, venous ulcers, bilateral varicoceles, atrial fibrillation, duodenal ulcer, haematuria and an incisional hernia. He was diagnosed with basal cell carcinoma in the calf in 2010 and squamous cell carcinoma of the pinna in 2014. 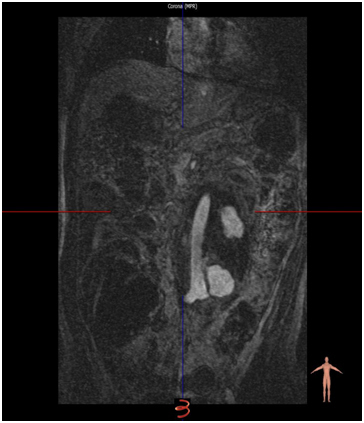 These were excised and hewas subjected to radiotherapy.CT angiogram performed recently was satisfactory (Figure 2). Figure 2. 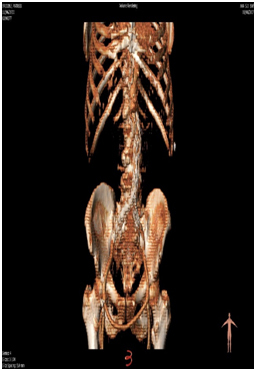 3D CTA at 14 years demonstrating stable AUI and aortic sac with a patent fem-fem cross over. Open repair of abdominal aortic aneurysm has been the gold standard operation for several decades. After FDA approval for stent graft in 1999 there has been a surge in deployment of stent grafts all over the world. Now EVAR hasbeen shown to be durable and has replaced open repair as the new gold standard in most deliberate practice volume centres. Re-do aortic surgery to deal with the case reported above, has a mortality close to 45-60% .This was conventional practice. We report REVAR as a bail out procedure for this patient, post open repair. This is one of the earliest reports of endovascular procedure used in an emergency setting post open repair. There may be several reasons for failure of open repair including poor quality aortic wall, extensive endarterectomy, suture fatigue, cheese-wiring of the suture through the aortic wall or infection. Less than 5% of open AAA repairs have been reported to have false aneurysms . There may be more false aneurysms than we might think, but as follow up of open repair is limited, it can be difficult to detect false aneurysms.Reports of disruption of anastomosis, mimicking type 1 endoleak are rare and few cases have been reported in the English literature. Our experience has been mirrored by Astarciet al. .They used a bi-iliac device as a bail-out procedure while we used anuni-iliac device and an extra-anatomical bypass. Arya et al. have reportedon a similar case, which was tackled with open repair.They found a loose suture on opening the sac. The second case in their series was endotension due to seroma around the graft. The French trial has shown that early outcome for anatomically suitable leaking aneurysms are similar in EVAR and open repair. This has been earlier ratified by two major trials . The French group have demonstrated that 32.8% of patients with ruptured AAA, were haemodynamically stable and anatomically suitable for REVAR.We haveillustrated the durability of REVAR even with the previous generation stent grafts. REVAR has been shown to be durable while we await EVAR to be crowned the gold standard procedure for AAA repair. Stent grafts can be successfully deployed to counter post open repair catastrophes. Astarci P, Zhou SS, McWilliams R, Blair SD, Brennan J, et al. (2005) Endovascular repair of type1 endoleak following open repair of abdominal aortic aneurysm repair. EJVES Extra10: 114-6. ©2015 Subramaniam M.This is an open-access article distributed under the terms of the Creative Commons Attribution License, which permits unrestricted use, distribution, and reproduction in any medium, provided the original author and source are credited. Professor, Western Vascular Institute, Department of Vascular and Endovascular Surgery, University Hospital Galway, National University of Ireland, Galway, Ireland.